Parishioner’s dedication to Father Colleton’s promise in 1881 that brought St Aloysius community to life continues to grow with the completion of the Grotto of the Blessed Virgin Mary. Many hours of planning, decision-making, and hard work have gone into making this dream a reality. A dream many may not know about. In 1944 Rev. 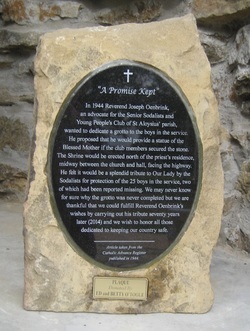 Joseph Oenbrink, an advocate for the Senior Sodalists and Young People’s Club of St Aloysius’ parish, wanted to dedicate a grotto to the boys in the service. He proposed that he would provide a statue of the Blessed Mother if the club members secured the stone. 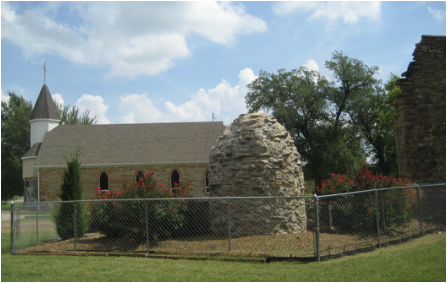 The shrine would be erected north of the priest’s residence, midway between the church and hall, facing the highway. He felt it would be a splendid tribute to Our Lady by the Sodalists for protection of the 25 boys in the service, two of which had been reported missing. We may never know for sure why the grotto was never completed but we are thankful that we have fulfilled this tribute and we wish to honor all those dedicated to keeping our country safe. We are hopeful that this symbol of our catholic faith will inspire future generations to carry on the legacy. Grotto dedication will be held on September 21, 2014, during our Greenbush Day Cerebration. Back of grotto with 1886 church in background. 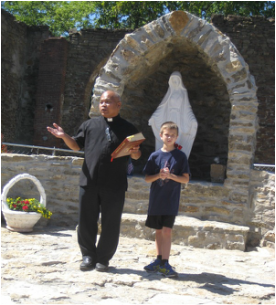 Father Roger Lumbre blessed the Grotto of the Blessed Virgin Mary on September 21, 2014 at the 22nd Annual Greenbush Day event. 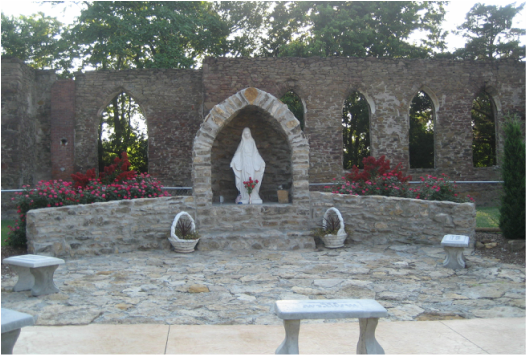 A plaque titled "A Promise Kept" was placed on the Grotto of the Blessed Virgin Mary detailing the tribute which was fulfilled by the completion and dedication on September 21, 2014.